By AsiaToday reporter Kim Ye-jin - Concerns are growing about a spreading anti-Korean sentiment in Japan, following a recent case of a famous sushi restaurant in Osaka serving extra amounts of wasabi to Korean customers. Moreover, there was a case of an employee of a bus company in Japan writing "Chon (ちょん)" on the bus ticket of a Korean tourist. "Chon" is a derogatory Japanese term to refer to Koreans. 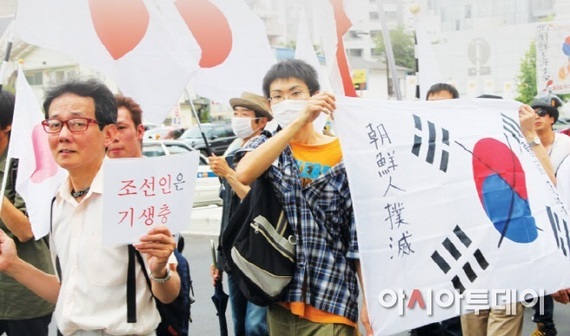 Such violent and racist behaviors created quite a stir in both Japan and Korea. Anti-Korean sentiment has a long history in Japan. The term "Chon" comes from "Chōsenjin", an insulting term to refer to Korean residents in Japan. In Japan, the issue of hate speech is becoming more and more serious. On Oct. 31, Jiji Press defined hate speech as "discriminatory remarks that instigate exclusion due to hatred based on nationality, race or religion," and explained that anti-Korean rallies of a racist group named "Citizens' group not allowing the privileges of Korean residents in Japan" (so called "Zaitokukai" in Japanese) caused hate speech to become a social issue. Anti-Korean rally is a typical example of hate speech. The Japanese government is focusing its efforts to counter racial discrimination such as hate speech and to prepare countermeasures. However, the Japanese Justice Ministry confirmed that 1,152 hate speech rallies were held from April 2012 to September 2015. On January 31, a male resident of Kawasaki held an anti-Korean hate-speech rally threatening to kill "cockroach" Koreans. Choi Kang-ija, a 42-year-old third-generation Korean resident of Kawasaki, filed an application for human rights relief to the Ministry of Justice in March, and the ministry in August urged the rally organizer not to repeat similar acts. Last month, the Osaka District Court ordered Makoto Sakurai, former head of Zaitokukai, to pay 770,000 yen (approx. KRW 8.4 million) to an ethnic Korean woman for defaming her with anti-Korean remarks. Ironically, the number of foreign residents in Japan topped a record 2.3 million as of June. The Japanese government will conduct a survey on hate speech against foreigners in the country ahead of the 2020 Tokyo Olympics. In an unprecedented survey, the government will ask 18,500 foreign residents in Japan to describe their experiences of being discriminated, and will release the results in March next year to plan measures to combat discrimination. Efforts are being made to understand each other through cultural exchanges. Ethnic Korean writer Choi Sil-yi wrote the novel Jini's Puzzle (translated title) and won the Gunzo New Writers' Prize this year. Based on the writer's experience, the novel tells the story of an ethnic Korean girl named Park Jin-hee, who transfers to a school for Koreans after experiencing discrimination in Japanese elementary school but finds it difficult adjusting to the new school because of her poor fluency in Korean. Korean authors in Japan have been revealing the reality of anti-Korean sentiment in Japan through novels based on their own experience of discrimination. In July, Shigeru Kinoshita wrote a book titled "The Mole and Kimchi" that begins with a scene whereby a middle-aged man encounters a hate speech demonstration and looks back on his childhood where he attempted to hide his Korean identity after changing schools. Kinoshita came upon the idea for the story after witnessing a hate speech demonstration in 2013 in Tokyo.